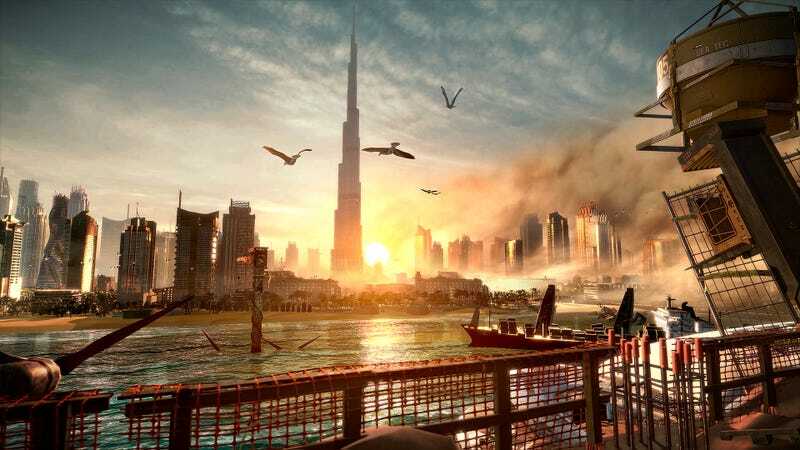 If I was forced to accept the cursed term “walking simulator” as a proper game genre, my last wish would be that those post-modern developers can learn something from Deus Ex: Mankind Divided and of course, its predecessor Human Revolution. If you play in the stealth way, Deus Ex: Mankind Divided have never given sufficient pressure a proper stealth game should. It is a game where I can leave Adam in a cover in a room with three guards and go to lunch without worrying about being discovered. It is a game where I intentionally use multi-tool for a door I have no need to open, so that I do not waste the overflowing crafting parts. It is a game where during the final boss “battle”, I can LEAVE the battle field, sip a cup of Whisky, listen to the gossip of guests, explore a few vents and find a different route than last time to the boss room. Yet, I enjoy this game, and also Human Revolution which has largely the same gameplay. It is simply a luxury to run aimlessly into a random dorm on the road side. I just want to hack into normal people’s computer and read their life, even if it is not always interesting, to sneak into a room the dealer won’t let me in and sell his own weapons to him one by one, even if you can hardly spend more than 30000 credits (most of that is for praxis kits) in the entire game. When you want to show people something but do not want to design AI or balance the combat (is this the definition of walking simulator? ), Deus Ex: Mankind Divided is the best thing to learn from. We can find a delicate balance between gamer’s power and the world’s order. As a gamer, you have access to various privileges, such as becoming immortal by hiding in the vent, using third person view for free in the cover. These result in the overall very easy stealth gameplay and a great degree of freedom. However, this power is not enough for you to ignore the rule of the world. You have to deal with whatever obstacles in front of you. They are easy, but the point here is you have to deal with them, and in this process, learn the world. In the end of each mission, I really have a picture in my mind rather than icons scattered on the in-game map. In order to find hidden pass, I learn the buildings, how they are built and connected. In order to find important information, I learn the people, how they are related, what they are thinking about and even the tone they speak. While the story of MD feels too conservative and seems truncated, it is an okay starting point of a new saga. I think the story seems not to go anywhere just because Adam Jensen cannot reach anywhere yet. He is little more than a witness and a fire watch in this trend of the world pushed by much more powerful groups of people. He doesn’t even know what he is fighting against. Neither is Prague the center of the world, it is just one location that those powerful people could or could not think of when they plot the next step. This is nowhere the best story but a better one to me than the finale of Human Revolution where a cop changes the mind of the greatest scientist and decides the future of humanity with a switch. I will always trade a crazy and aloft story for an unexciting but thoughtful one. In the sequel, if there is sequel, we can expect as Adam dives deeper, Illuminati finally decides take a few minutes to deal with him, that would lead to some more exciting twists. Even Adam’s special DNA, mysterious origin and ambiguous self-identification no longer matters at the face of the current problem. It is a shame that after an amazing debut in Human Revolution, Adam doesn’t receive the any more personal Geralt-like development, but this is more or less saved by all the great stories in side quests. While Adam fades away, I show up in these quests. The quests in this game insert themselves between main plots in a very natural way. They are an organic part of the exploration. An extra question in conversation, a glitched ad board or even an impulse to over come another obstacle could lead you into an unexpected event. The game does suffer from a great number of problems, aside from the ugly signature from its publisher like microtransaction and some meaningless collectibles. Dividing the Prague into zones connected with loading screen is as painful as dividing human. This can be excused by each areas being bigger than ever before, but the problem is you do not have to travel between different areas so often in the past, this completely divide the experience. The presentation, like dialogue and camera, could use some more polish, I am particularly disappointed is that the game keeps good all the time but lacks some excellent moments. There are never dialogues, cutscenes or music that can helps the emotion I get from the story. Even that supposed-to-be the defining picture of the game at the beginning, when Adam watch the mother die in Prague terrorism attack, feels unimpressive. A deeper problem could be that the developer find the current status to be a satisfying one and no longer try to make any breakthrough, whether it’s story or gameplay. Even the best things I like will finally wear out in time. However, all these do not affect the fun time Deus Ex: Mankind Divided brought to me, and it is a strong contender of my GOTY 2016.